Saturday we had an amazing turnout for the monthly Oakland Urban Paths walk. At least 65 people and 7 dogs joined us for a walk exploring Cleveland Heights and the site of the former "Borax" Smith estate. 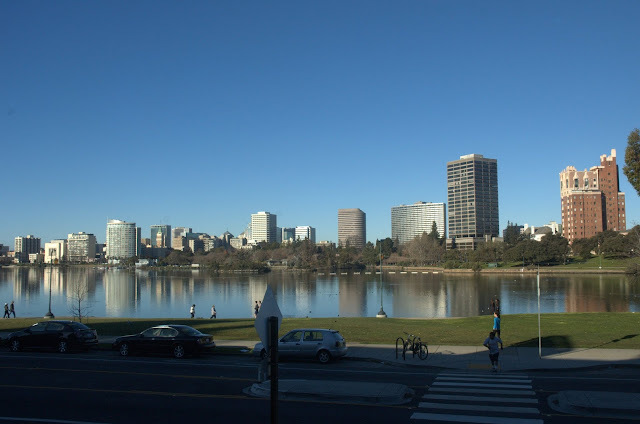 It was a chilly but beautiful morning, and the view over Lake Merritt was breathtaking. We started the walk at the Cleveland Cascade. 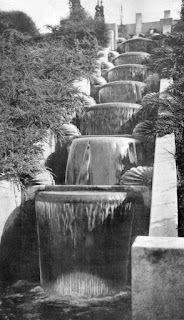 Designed by landscape architect Howard Gilkey in the 1920s, the cascade had 3 levels of 7 steps each. Each step had a bowl that made a curved sheet of pouring water. 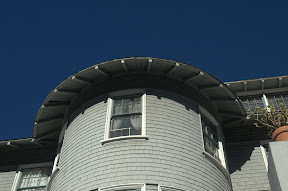 At each side were shell-shaped brackets, behind which were lights running through the colors of the rainbow. 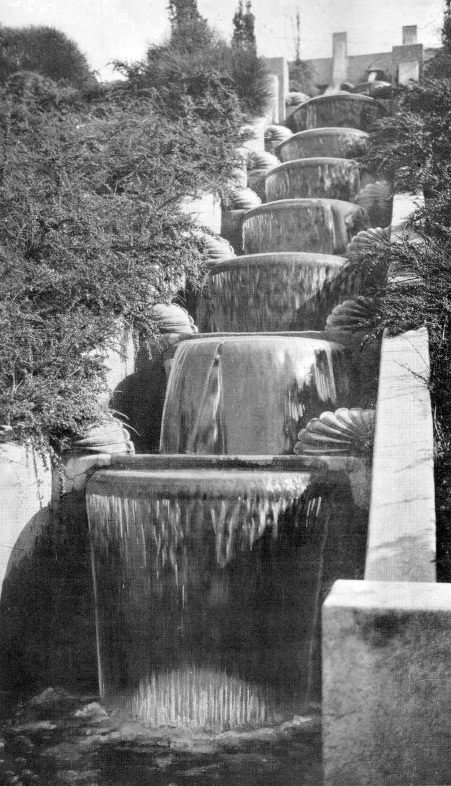 Over time, the cascade and nearby steps became rundown and overgrown. Barbara Newcombe was part of the original group that helped rediscover and uncover the cascade back in 2004, and was there on Saturday working on the stairs. The Friends of the Cleveland Cascade group has cleaned up and maintained the stairs, installed new railings and LED lighting, and created replica cascade fixtures that will be installed when enough money has been raised. 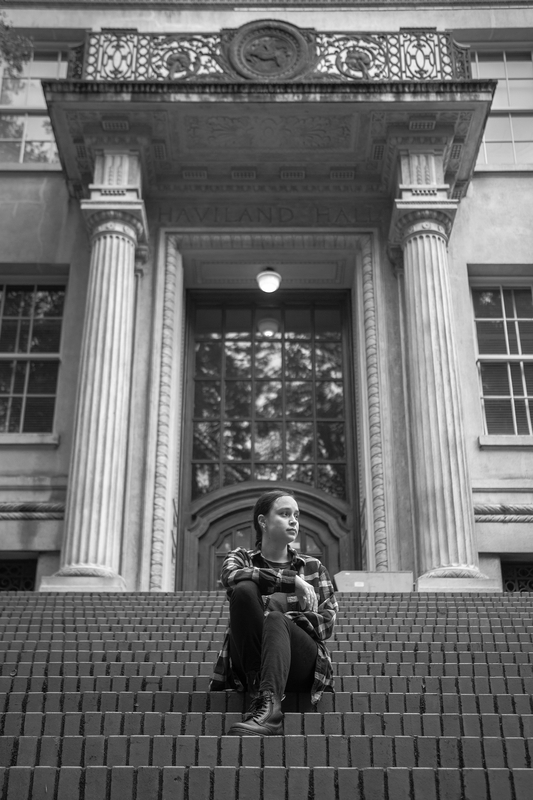 These days the stairs are heavily used, by people walking between Cleveland Heights and Lake Merritt, by people exercising, or just looking to get a different view of the lake. Read more about the Cleveland Cascade from in last year's OUP: Jane's Walk. We walked up the steps along the Cascade and around to Cleveland Street. Area maps show a right of way between the top of the Cascade and Cleveland Street, but there are no signs that steps were ever built there. The question of "what neighborhood is this?" led to questions about the boundaries of Cleveland Heights, other names for smaller areas within it like Haddon Hill, and the general question of "what's a neighborhood?" The main take-away is that neighborhood boundaries are fuzzy at best. Even though my Oakland Neighborhoods map has clear boundaries, the reality is that it depends on who you ask. Along our way east, we admired some of the beautiful houses and apartment buildings, pieces of street art large and small, and of course I was checking out sidewalk stamps. 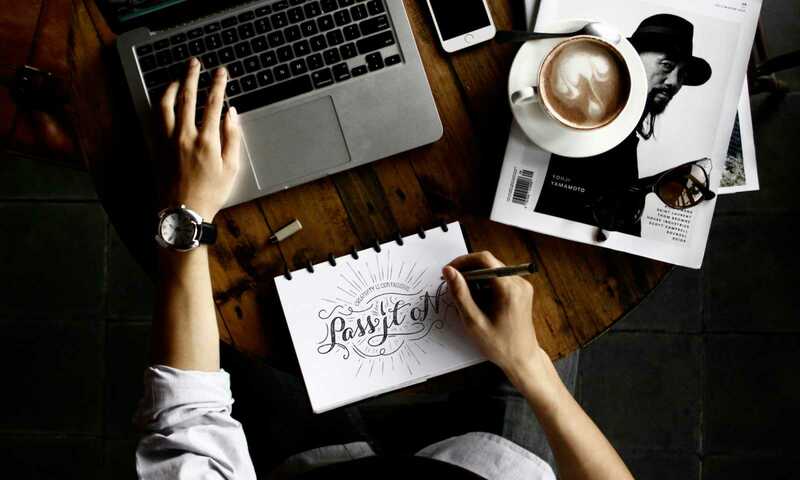 They can give clues about the age of a neighborhood. We crossed over Park Boulevard into Ivy Hill and Bella Vista, which is where the "Borax" Smith estate was. Francis Marion "Borax" Smith made his fortune in borax mining, and coined the slogan "20 mule team borax" which is still in use today. Smith is better known in Oakland for creating the Key System of streetcars. He and his business partner Frank Havens created the Realty Syndicate and bought large pieces of land then sold smaller pieces for development. To get people out to see the real estate, Smith bought up various streetcar lines and combined them into what became known as the Key System. 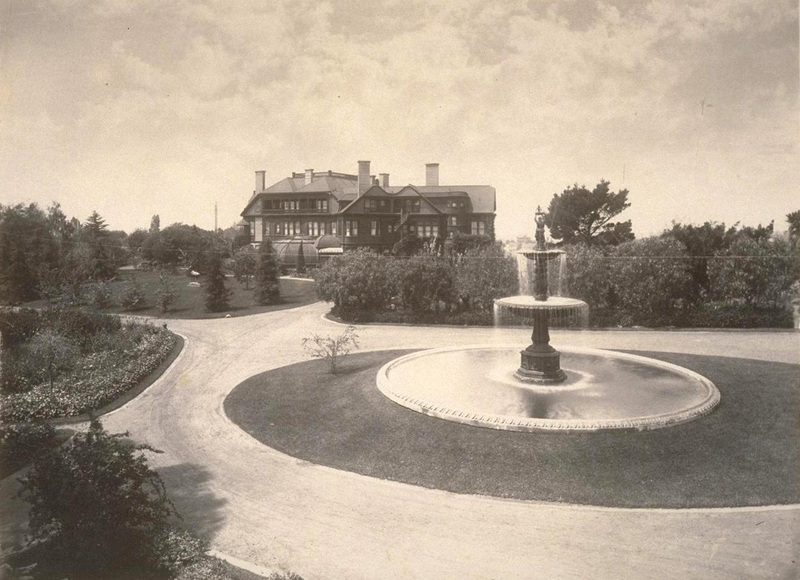 To encourage people to visit, destination resorts like the Claremont Hotel were built. Traces of the Key System can be found all over Oakland, sometimes in subtle ways. Sometimes they're still there, like the Claremont Hotel, and the Realty Syndicate building at 1440 Broadway. 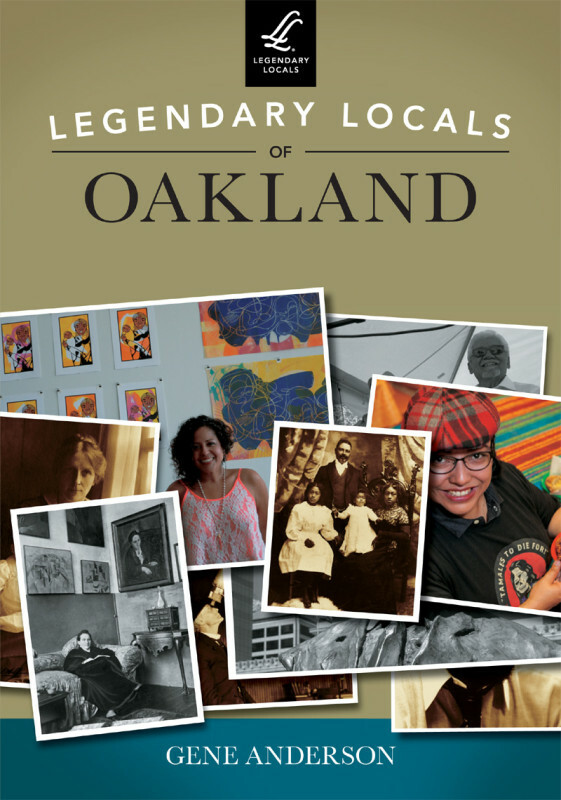 We were fortunate to be joined by Dorothy Lazard, head of the Oakland History Room at the main Oakland Public Library who told us more information as we went along. Further along, we saw another wayfinding mark: a row of palm trees. They mark one edge of the Smith estate, which was known as Arbor Villa. The house itself was called Oak Hall, and was extravagant. It had 42 rooms, including 15 bedrooms; a ballroom; a bowling alley including a ball return; an organ with 18 or more ceiling-height pipes; an attached conservatory; and even a miniature borax mine. The 50-acre grounds were equally impressive, with a 5-story tower with an observatory; a large lily pond; a paddock where deer were kept; stables; several greenhouses; and a variety of guest houses and other structures. 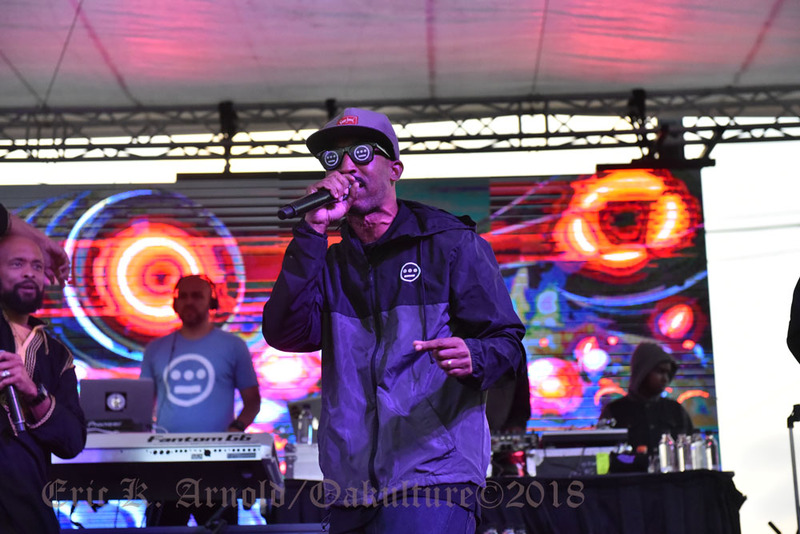 I was inspired by what I'd learned on the Oakland Heritage Alliance "Borax" Smith tour and the bits and pieces I found online preparing to lead Saturday's walk. So Sunday afternoon I joined other like-minded Oaklanders at the Oakland History Room and did more research on Arbor Villa. I've started an Oakland Wiki page about Arbor Villa, and will be updating it as time permits. Other things I learned about where the existence of an archery range, a small man-made cave called "The Grotto", a cattery(! ), and various gardens. One information source was the Sanborn maps, which were created to estimate fire insurance rates. So I also found other details like the observatory tower contained a 10,000 gallon water tank. We crossed back over Park Boulevard, but we weren't done with the Smiths yet. Frank and his wife Mary donated money for the building of the El Campanil at Mills College. Mary was inspired to help children. After reading Benjamin Farjeon's Blade O' Grass about orphans in London, she took in various orphan children. Frank gave 34 acres of land across from Arbor Villa, and endowed the Mary R. Smith Trust for her to start a "home for friendless girls", AKA orphans. "The Lodge" (a home that's still there) at the center served as the intake office. Eventually 13 cottages were constructed for the girls to live in, and each cottage was given an endowment. A larger structure called the Home Club was constructed where Oakland High School is now, and served as a central clubhouse for different activities. Along Park there is stairway that goes up the hill between several apartment buildings. Although it was a public right-of-way, it's no longer publicly accessible. The stairs are also where a long, arbor-covered stairway went up the hill to the Home Club. 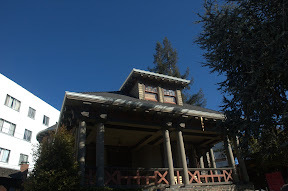 A little further along Park is large home, which was one of the 13 cottages, and was designed by Julia Morgan. Some of the other cottages still exist, and were designed by such notable architects as Bernard Maybeck and George W. Flick. Our journey back took us across Haddon Hill, past more beautiful homes, apartments, and church buildings. Of particular note was a large home that was owned by noted industrialist Henry J. Kaiser. He started Kaiser Aluminum, Kaiser Shipyards (which built tons of ships during WWII) and what eventually became Kaiser Permanente, the first HMO. I've heard that Franklin Delano Roosevelt stayed there at least once while in the SF Bay Area. Across the street is a stairway at the end of Haddon Road. As recently as 30 years ago, it was open and accessible. Now it's blocked off by fences, and overgrown by trees and other plants. While it's sad to see public stairways cut off, but it's also understandable when an area wants to restrict easy access from some streets. It was doubtless very different before the MacArthur Freeway (I-580) was built, but now that section of MacArthur feels somewhat orphaned because it's cut off by the freeway. Our final stairway took us down from Merritt Avenue down to Beacon Street. It's another historical staircase, and beautifully if somewhat impractically designed. Each section of stairs has a different design, whether curved, bay-shaped, or straight. They're also smaller than would be permitted under current building codes. Fortunately a neighbor at the top of the stairs warned us that several of the steps at the bottom were broken, so we proceeded down with extra caution. I reported the problem with SeeClickFix, an online system for reporting potholes, vandalism, and other problems for the Public Works to address. If you'd like to help fix the problem, click here and vote. Special thanks to Chris Kidd for the use of some his photos. I've discovered that leading a walk (particularly a large one) makes it harder to take pictures of the walk. If you have pictures of the walk you'd like to share, let me know. Those of you who had difficulty hearing me talk (which is probably all of you at some point) will be happy to know we're going to use your generous tips to invest in a portable sound system so large groups can hear better. Thanks to everyone who showed up! Hope to see you at the next Oakland Urban Paths walk, which will be the second Saturday, February 9th. The location is yet to be determined, but it'll be in Oakland and it'll be fun!